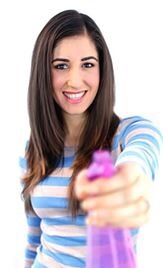 P&G teamed up with fun YouTube sensation Melissa Maker of Clean My Space to bring you the best laundry and cleaning tips this month. Melissa sheds light on some key do’s and don’ts when it comes to doing your laundry, answering all questions related to high-efficiency washing machines and detergents! Here are her tips to help make sure your clothes stay fresh and clean this season. Never leave your washing machine door closed when not in use. This creates a damp and dark environment which is perfect for mildew. Instead, wipe the inside of your machine down after each use and leave the door ajar, it will never, ever smell! Never over-dose (or under-dose) detergent. Many Canadians tend to under dose or overdose their detergent portions. Use the markers on your cap as a guide, and compare the fullness of your machine to the marker on the cap – if it’s less than half full, use the least marked amount, if it’s brimming, use the highest marker. Your detergent has been designed with lots of R&D and they’ve indicated the ideal dosage for you to get the best wash results. Using too much detergent can leave suds behind and clothing will come out dingy, since suds cling on to extra dirt and redeposit that onto your clothing! Never use detergents that make lots of suds (especially for HE machines).I’ve played around with several detergents to understand how they work. Ultimately we want detergents which create the least amount of suds, since suds kick the machine into extra rinse cycles which lead to extra wash time (25 minutes. on average) and 10 gallons of water (on average). Tide HE Turbo is the best detergent I’ve found because it has Quick Collapsing Smart Suds technology, which is essentially a fancy way of saying that the suds break down super fast. This means your machine sees no reason to go into extra rinse cycles and using the right detergent will ultimately save you wash time and gallons of water! Once you re-think your laundry routine and set your machine up for success, you will absolutely love the results. 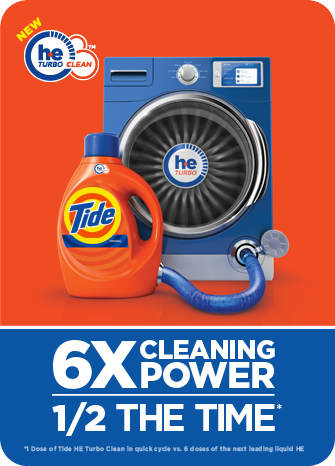 Tide HE Turbo: specially reformulated with HE Turbo Clean technology for 6x the cleaning power in half the time. Never throw everything in the dryer. Heat isn’t good for clothing, in fact, using the least amount of heat to get your clothing dry and free of wrinkles is the way to go. I recommend hanging nearly every garment, except for items like socks, certain underwear (i.e. nothing fancy), undershirts, loungewear, etc. If you have a garment you really care about, hanging it to dry will ensure that its fabric and shape will be preserved. To hang dry, shake the item out a couple of times once you’ve grabbed it from the wash, this gets rid of most wrinkles and debris, and then hang it to dry. Everything else can go in the dryer, and you will be able to use a low heat setting and run it for less time, therefore saving energy.